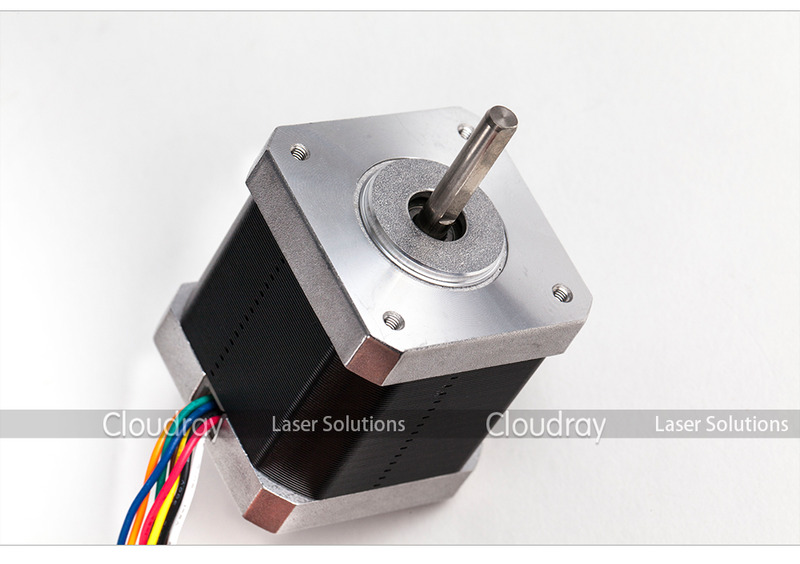 Made of high quality cold roll sheet copper and anti-high temperature permanent magnet, Leadshine's stepper motors are highly reliable and generate low motor heating. 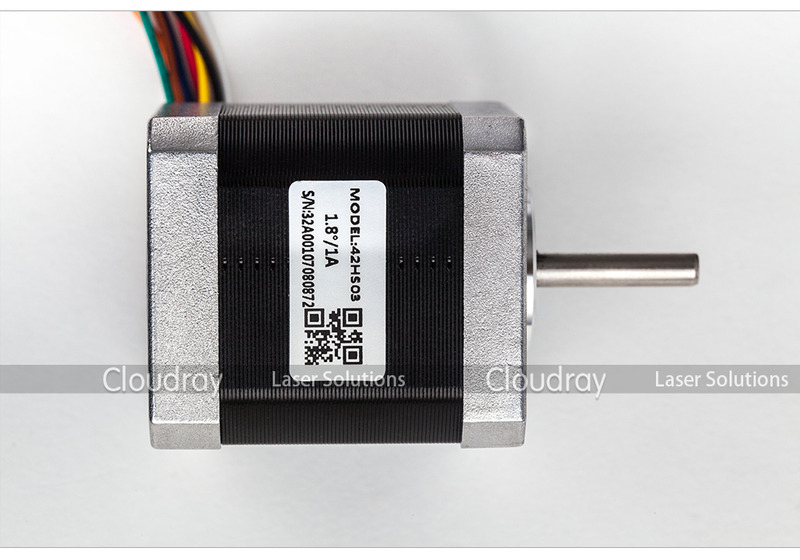 Because of their nice internal damping characteristics, those stepping motors can run very smoothly and have no obvious resonance area within the whole speed ranges.The 42HS03 two-phase stepper motor is suitable for a wide range of motion control applications. 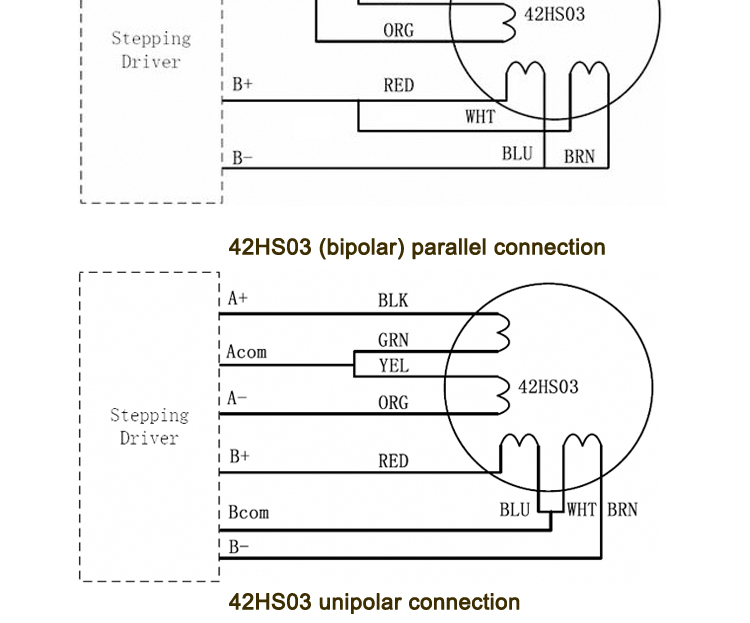 Terminated with 8 motor leads, the motor can be connected in a few different ways, including bipolar series , bipolar parallel and unipolar. 1. 2 phase 1.8 degree stepping angle. 3. Output current up to 7.2A. 4. Holding toque of 0.47 N*m (67 oz-in). 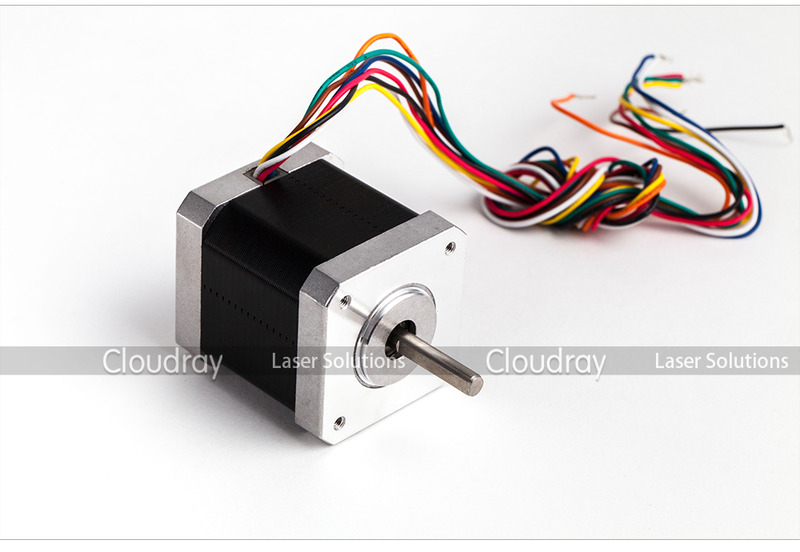 Unipolar and bipolar half coil, because we are using less turns, does not give us great low speed torque, but because of the low inductance, holds the torque out to high speeds. Bipolar series uses the full coil so it gives very good low speed torque. But because of the high inductance, the torque drops off rapidly. Bipolar parallel also uses the full coil so it gives good low speed performance. 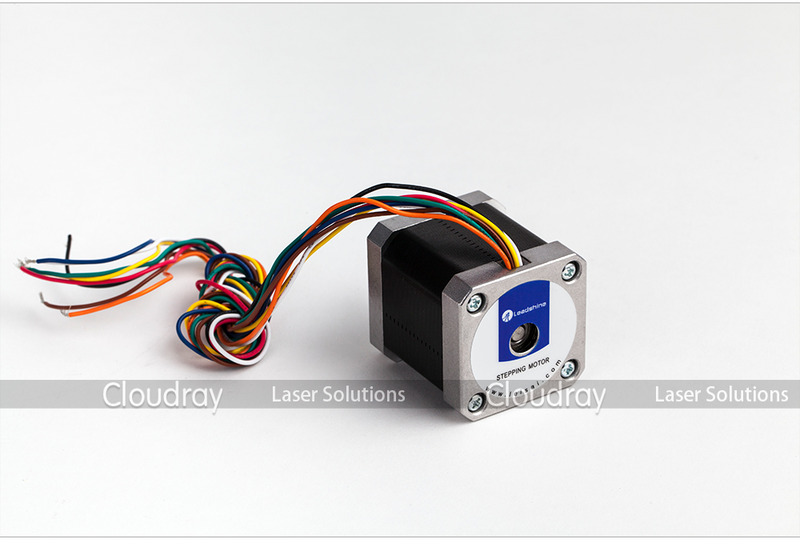 And its low inductance allows the torque to be held out to high speeds. But remember, we must increase current by 40% to get those advantages. Speed-torque curves show the maximum torques that can be output at a given speed. When selecting a motor, make sure the required torque falls within the particular curve. 1. Title "42HS03 Rated current/phase: Parallel, 1.4A (RMS); Series, 0.7A (RMS); Half-coil, 1.0A (RMS)" means "When the 42HS03 used in parallel mode, its current/phase is 1.4A (RMS); When the 42HS03 used in series mode, its current/phase is 0.7A (RMS); When the 42HS03 used in half-coil or unipolar mode, its current/phase is 1.0A (RMS)". 2. 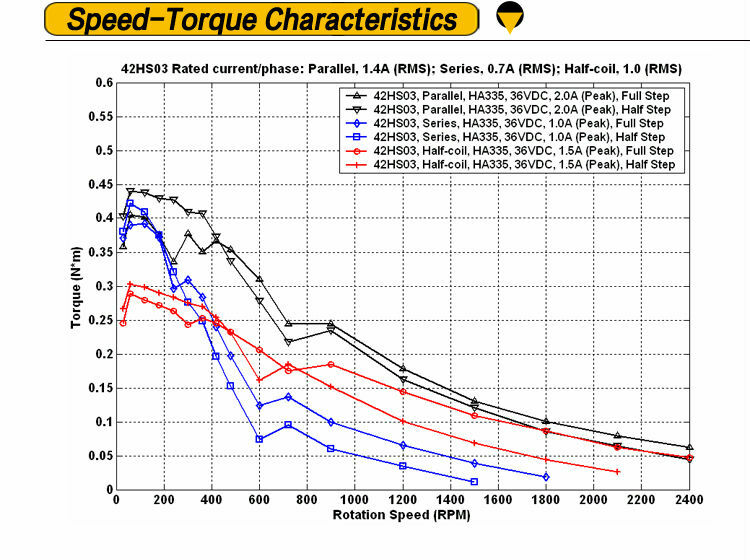 Legend "42HS03, Parallel, HA335, 35VDC, 2.0A (Peak), Half Step" means "This speed-torque curve of the 42HS03 (connected in parallel mode)was done with the HA335 driver. 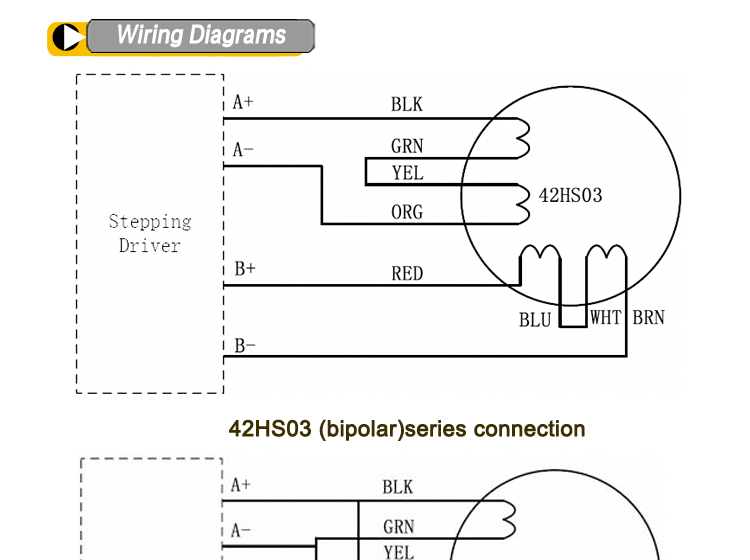 The settings of the HA335 are 2.0A (Peak), Half Step and use 35VDC power supply ". 3. The actual characteristics will vary depending on the driver used. Please use these curves only for reference purposes when selecting a motor. You must also conduct a thorough evaluation with the actual driver to be used.